PALMETTO, Fla. – Port Manatee and Colombia are looking to expand commercial ties following a visit to the Florida Gulf Coast port from a Colombian trade official. “We see significant opportunity for growing trade between our nation and Port Manatee,” said Juan C. Barrera, general deputy director for the United States of ProColombia USA, who spoke Thursday [April 20] at the Manatee County Port Authority meeting, as well as at a luncheon hosted by the Bradenton Area Economic Development Corp.
“Both import and export opportunities exist for businesses in Manatee County and beyond, and we look forward to exploring these mutually beneficial possibilities,” said Barrera, whose role with the Colombian trade agency includes serving as director of its food, beverage and floral efforts. Colombia ranks as the third-largest economy in South America, with its gross domestic product trailing only those of Brazil and Argentina, and its population of 49 million makes it the third-most-populous country in all of Latin America, behind Brazil and Mexico. Among Port Manatee trade partner countries, Colombia currently ranks as No. 9 for exports, propelled by fertilizer, and No. 16 for imports, also led by fertilizer. “Not only do we anticipate building upon the fertilizer trade, but we expect to grow our commercial links with Colombia in other commodity sectors as well,” said Vanessa Baugh, chairwoman of the Manatee County Port Authority. The Colombian official’s visit is the latest of a number of such calls, with representatives of Costa Rica and the Dominican Republic having recently spoken at Manatee County Port Authority meetings and presentations scheduled in coming months from trade leaders from Guatemala and Turkey. Since opening in 2014, the International Trade Hub at Port Manatee has played an integral role in expanding global connections for the port and Manatee County enterprises. 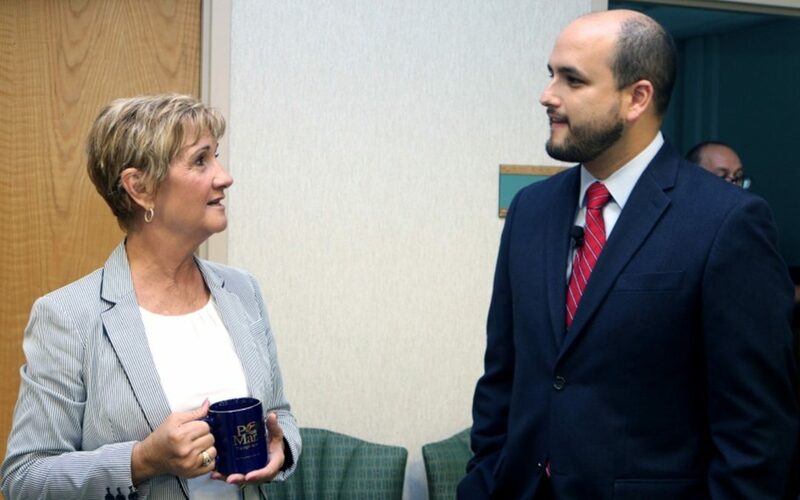 Manatee County Port Authority Chairwoman Vanessa Baugh, left, discusses trade opportunities with Juan C. Barrera, general deputy director for the United States of ProColombia USA.